Lord, what is going to happen to us? A reoccurring question that keeps coming from time-to-time in my prayers is, “Lord, what’s going to happen to us (Patti and I) God?” It usually starts popping up in my prayers following some form of challenge life puts in our journey. I remember in the weeks and days just prior to my heart surgery back in September it was a regular. And like always there was no direct answer only the reassurance of the presence of the Holy Spirit which was all we really needed. 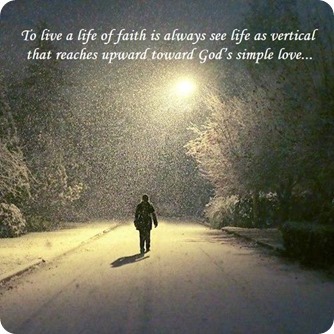 To live a life of faith is always see life as vertical that reaches upward toward God’s simple love rather than outward toward a complex hostile world.